Carter Dome Mountain is a 4,832 foot mountain in the White Mountains. 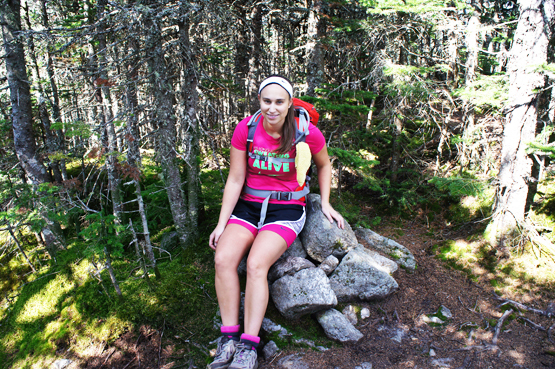 It sits in the Carter-Moriah Range, which runs along the northeastern side of Pinkham Notch. There are rumors that the mountain is named after a hunter named Carter, and a neighboring peak, Mount Hight, is named after his hunting partner, Hight. 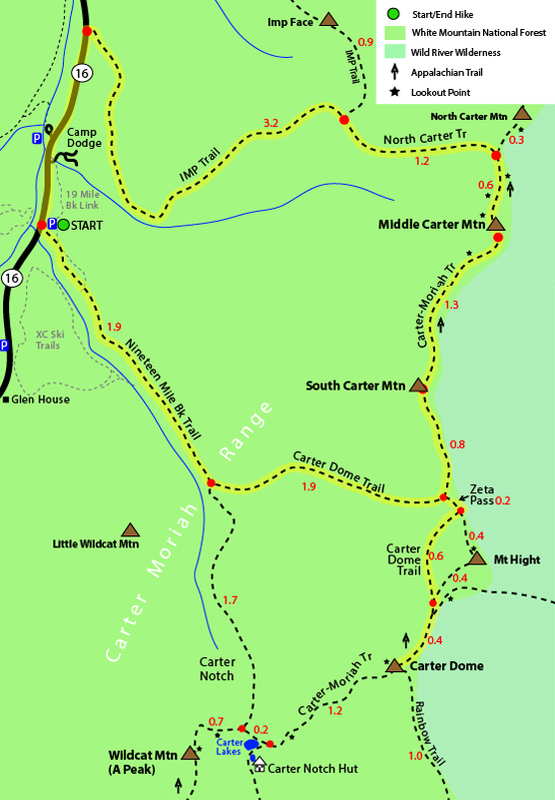 Middle Carter Mountain is a 4,610 foot mountain, also in the White Mountains is part of the Carter-Moriah Range. The summit itself is wooded, so there are no views. But you can enjoy some great views shortly before and after the summit along the Carter-Moriah Trail, which is also part of the Appalachian Trail. 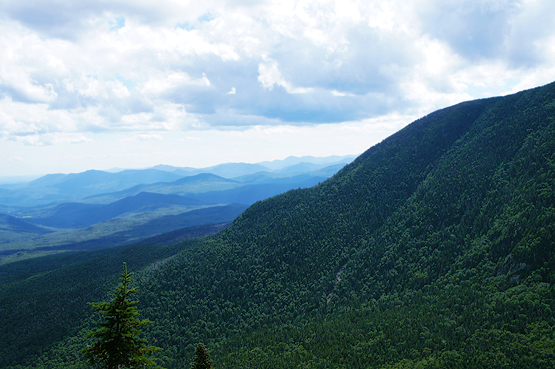 South Carter Mountain is a 4,430 foot mountain in the White Mountains. It sits in the Carter-Moriah Range. The summit itself is wooded, so there are no views. But you can enjoy some great views shortly before and after the summit of Middle Carter Mountain along the Carter-Moriah Trail, which is also part of the Appalachian Trail. Begin at the Nineteen Mile Brook Trail Parking lot. 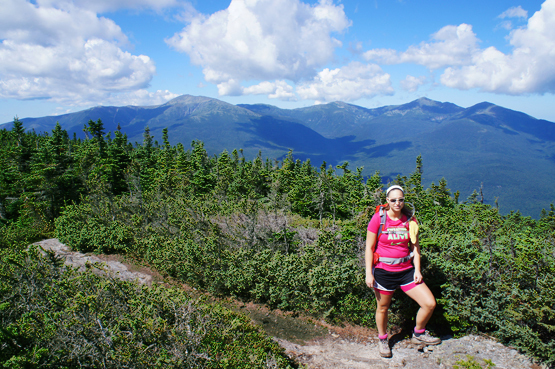 Hike up the Nineteen Mile Brook Trail for 1.9 miles until you reach a junction with the Carter Dome Trail. Stay left onto the Carter Dome Trail for 1.9 miles where you will come to a junction with the Zeta Pass on the right, and the Carter-Moriah Trail / Appalachian Trail on the left. Stay left on the Carter-Moriah Trail and hike for 0.8 miles until you reach the summit of South Carter Mountain. 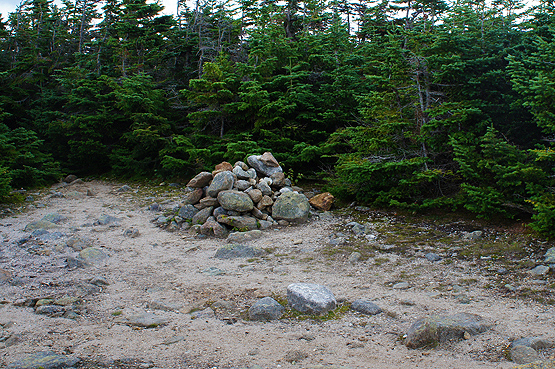 To continue over to Middle Carter Mountain, continue along the Carter-Moriah Trail for another 1.3 miles where you will reach the summit of Middle Carter Mountain. You can enjoy incredible views of Mount Washington on a clear day between the two mountains just before Middle Carter Mountain. To begin your descent to the parking lot, continue hiking along the Carter-Moriah Trail for 0.6 miles until you reach a junction with the North Carter Trail on your right. Take the North Carter Trail for 1.2 miles until you reach a junction with the IMP Trail. Take the IMP Trail down to route 16 for 3.3 miles. (If you have someone who can pick you up from the road, here is where they can get you.) Turn left onto route 16. You will walk the last part of your hike on route 16 for roughly 1.5 miles until you reach the Nineteen Mile Brook Parking Lot. Take exit 35 off I-93 where you will end up on US-3 / N towards Twin Mountain / Lancaster. Continue 12.3 miles and turn right onto NH 115 N. Drive 9.6 miles and turn right onto US-2 E / Presidential Hwy. Drive 12.5 miles and turn right onto Main Street. Drive 1.4 miles and turn NH-16 S / Glen Road. Drive roughly 6.8 miles until you see the Nineteen Mile Brook Parking Lot on the left side.